Color, clarity emphasized in Jersey Surf’s "[mondo mondrian]"
The program will draw from the works of Piet Mondrian, a 20th-century Dutch artist who was most well-known for his abstract works. Three years removed from its most recent top-25 semifinalist finish, Surf earned 27th place with its 2017 production, “Make it Our Own.” In the eyes of first-year program coordinator Thomas Kershaw, “[mondo mondrian]” will bring a fresh, new style to the Camden County, New Jersey corps. As will be reflected in the show’s design, particularly from a visual standpoint, Mondrian’s work is predicated on his boiling aspects of life down to their “essence.” In doing so, Mondrian often features color in its simplest forms, through the use of the primary colors, red, blue and yellow. Kershaw says that different portions of the show will emphasize both the visual nature of those colors, as well as the kinds of feelings connected with them. “We have movements of the show that are geared towards red, geared towards blue, geared towards yellow, and we’re extracting the emotional content that we would associate with those colors,” he said. Other pieces in Surf’s 2018 repertoire include Hans Zimmer’s “Cornfield Chase” from “Interstellar,” The Who’s “Behind Blue Eyes,” David Maslanka’s “Symphony No. 4,” as well as the works of Steve Reich, Manuel de Falla and Frederic Chopin. “With simple color, we are able to look into that color and extract the feel of red or the feel of blue, and then pair it with an appropriate music selection that’s going to highlight the feeling we would get; the emotional attachment to that color,” Kershaw said. 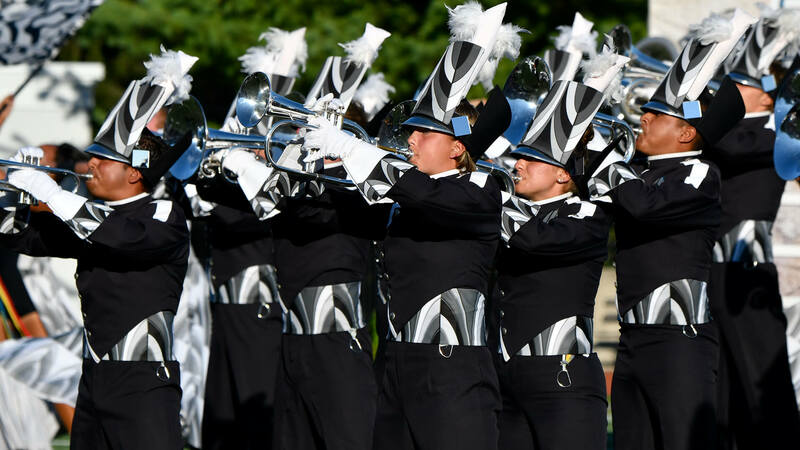 Jersey Surf will display its tri-color theme in its costuming as well; the brass section will wear blue, the percussion will wear red and the color guard will wear yellow, making for a considerably new look for a traditionally navy blue corps. With a simplifiable concept that translates well across all aspects of the program, “[mondo mondrian]” should help Surf achieve one of its key aspirations for the 2018 season. Jersey Surf will bring “[mondo mondrian]” to 20 different venues throughout the eastern half of the United States this season. The corps will open its 2018 tour on July 7 at CrownBeat in Lexington, South Carolina. View Jersey Surf’s 2018 DCI Tour schedule.